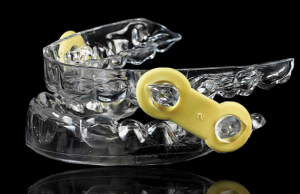 An oral appliance is a small acrylic or thermoplastic device that fits over both the upper and lower teeth or tongue. It is similar to an orthodontic retainer or mouth guard. It slightly advances the lower jaw or tongue, which moves the base of the tongue forward and opens the airway. A removable oral appliance either advances the lower jaw forward during sleep or prevents the lower jaw from collapsing during sleep which aids in keeping the airway open. This improves breathing and reduces snoring and apnea. The appliance is fabricated and customized for each patient by a dentist experienced in the treatment of snoring and sleep apnea. The appliances are comfortable and much better tolerated by the patients compared to CPAP. They are easy to place and remove, easy to clean and are convenient for travel. Research evidence shows that oral appliances are effective in treating snoring in 85-90% of the patients. The mandibular advancement devices are effective in normalizing the apnea levels in 75% of the patients with mild sleep apnea (5-20 events/hr. ), 60% effective for patients with moderate sleep apnea (20-40- events/hr.) and 40% effective for patients with severe sleep apnea (more than 40 events/hr.). Patients with moderate or severe sleep apnea must have a follow-up sleep study, while using the oral appliance to confirm the effectiveness of the device and a consultation with the sleep medicine physician to discuss the results. The American Academy of Sleep Medicine has stated that oral appliance is indicated as the first treatment of choice for patients with primary snoring and/or mild obstructive sleep apnea and as a second treatment option for patients with moderate or severe sleep apnea who cannot tolerate CPAP and/or are not good candidates for surgery.